HomeBlogBusiness Blogging Pros, Cons, Best Practices. According to a recent NM Incite report, there are over 181 million blogs around the world. The way many companies treat blogs in their content marketing mix is to incorporate blogs into their website as a section or subdomain, or host them on their own domain name as we do. 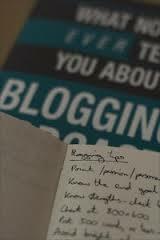 Definition of Blogging: Blogging is a form of content publishing leveraging a content management system such as Blogger, Typepad or WordPress that often publishes articles, video, images or audio in reverse chronological form. Business or corporate blogs are social media and content marketing tools used by companies to provide valuable, interesting content for customers, employees, industry media and other target audiences. Ideally, blog content fulfills a potential or existing customer’s need for information at some point in the purchasing cycle, in order to assist them in making a buying decision. Internationally, countless companies are using blogs to attract, engage and convert their target audience, though a select few stand out as masters in the corporate blogging trade. Whole Foods Market, for example, has an exceptional corporate blog called Whole Story, through which the grocery brand shares healthy eating tips, recipes, and more. Their focus on providing helpful, non-sales driven information to readers keeps them top of mind as a resource, rather than an advertiser, in the eyes of their fans. comScore’s blog is an excellent example of a B2B blog that has catapulted them into a mainstream news source, helping to build brand awareness and authority. Their top quality research and information has also helped their authors, like Eli Goodman and Andrew Lipsman, build their own personal brands, as well. Business blogs are a form of social media in their own right, though they work best as part of an online marketing strategy that uses other social channels for amplification and community building. Blog content should also be optimized for maximum visibility in search. Excellent tool for brand awareness, authority building, storytelling and passive sales messaging. Low barrier to entry with no technical or IT skills required to contribute content. Ability to measure and track performance. Flexible platforms with multimedia capabilities to distribute information in a variety of formats. SEO benefits; enhanced visibility in front of people seeking a specific type of information. Attract new customers, engage existing ones and convert both to buy  more and more often. Can be time consuming to create content. Requires a publisher mindset from brands possibly not used to this model. Requires planning, organization and editorial control, particularly with multiple authors. Creative, unique content can be a challenge. Blogging as part of an integrated online marketing and content marketing strategy is practiced and endorsed by top marketers from agencies and brands alike.